Enthusiasm for the Arab Spring is waning. It was embraced by the US when it was perceived as being responsive to Western pluralistic and liberal democratic ideals. Egypt is tottering on the precipice. Egyptian authorities have now banned the Muslim Brotherhood organization and intensified the crackdown on its supporters, with over 50 people reported killed in deadly clashes earlier this week. Libya and Yemen face perennial instability. Syria is in free fall. Saudi Arabia, Qatar, the UAE, Iraq, Iran and some other countries are confronting the oil versus democracy conundrum—not very successfully, one might contend, from the vantage point of the future of democracy. Egypt is the recipient of one of the greatest location rents in the world, second only to Israel. The US views Egypt as its lynchpin for security in the Middle East. In order to keep its military loyal, it provides $1.3 billion a year. Egypt is also the world’s largest per capita recipient of US food aid. This is where matters get complicated. Soaring rhetoric on democracy develops cold feet when it produces results that interfere with US national interest. This was first witnessed in the 2006 Palestinian legislative elections when the Islamist group Hamas beat the US-allied Fatah. The US refused to recognize the newly elected Hamas government only to make the Hamas held territory of Gaza even more of a haven for extremism. The US has avoided calling the military ouster of the democratically elected Islamist President Mohammed Morsi a “coup” for two reasons. One, such a characterization would, under US law, prevent it from channeling the billion-plus dollars a year to Egypt. Two, it would most certainly affect relations with the Egyptian army. Strong military ties between the two countries have thus far prevented President Obama from cutting aid. However, the escalation in violence this week has reopened the debate in the US, which is now beginning to lean towards cutting all but essential military aid. Egypt has a critical position not only within the US security architecture, but also as a trendsetter in the Arab world. The path it takes will set the pattern for the region. Since President Morsi’s ouster, Egypt has been rocked by political turmoil. The military has killed more than 1,000 people, most of whom are supporters of Morsi and his Muslim Brotherhood party, the bloodiest summer in the country’s modern history. Egypt’s military rulers have already drawn the battle lines. The narrative they espouse is one of secularists versus Islamist extremists, of security versus terrorism. It is a war in which the military has appointed itself as the guardian of the state. Since the coup, the generals have returned the country to martial law. They have used heavy firepower to break up peaceful protests, arrested prominent members of the Muslim Brotherhood, and detained over 2,000 Morsi supporters, most of whom are being held without trial. The interior ministry, another important arm of deposed dictator Hosni Mubarak’s state, is also asserting itself and has reinstated the old state security apparatus, the symbol of the authoritarian state. 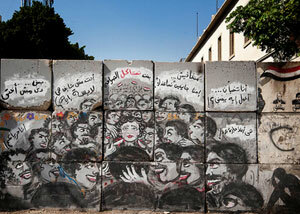 Reports from Cairo suggest that police and security services are again beginning to act with impunity. The primary targets of the military’s campaign have been the country’s Islamists, a push that has the support of many Egyptians. The military’s narrative resonates with a deeply polarized population, half of whom are suspicious of the Muslim Brotherhood, weary of political Islam, and inclined to view the Islamists as an existential threat. Such sentiments allow for the military to sell the crackdown and the return of the security state. But where does this leave the other half of the population? Fifty-one per cent of the country voted for Morsi. The weekly demonstrations taking place across Egypt provide an indication of the Brotherhood’s support base. This needs to be thought through. Will support for the Brotherhood diminish with Morsi’s removal? Can such a war be won? The Muslim Brotherhood has survived purges, arrests and detentions from the period of the first military coup that catapulted Nasser to power in 1954, through to Mubarak’s rule. Its leaders equate the current crackdown with their previous experiences and may well be gaining in strength and preparing for a longer battle. The current Brotherhood leadership calls for the continuation of peaceful protests and denounces violence. But it is likely that some supporters will turn to militancy following the ban and other, more extremist Islamists groups will also respond to the military’s attacks with force. Having radicalized the Islamists to fight will in turn benefit the military, enabling it to expand the security state even more. Three attacks have taken place against the state just this week, including a shooting near the Suez Canal, a car bomb near the Red Sea, and a grenade attack in Cairo. In September, the interior minister barely escaped an assassination attempt. The resurrection of the ban on the Muslim Brotherhood and the organization’s suppression can only lead to further radicalization and instability as groups even further to the right of the Brotherhood and the Salafis express their disenchantment with the system. It would have been far wiser to have let the Muslim Brotherhood rule and discredit itself in power. Radicals do not necessarily make good administrators. They would have been unable to deliver on the revolution’s promises of socio-economic justice and would have been toppled through the ballot box instead of the bullet. It would have also kept the democracy project alive. But support for democracy, particularly in the Middle East, has always been problematic. Hardeep S. Puri was India’s permanent representative to the UN and is a senior adviser at the International Peace Institute. Nur Laiq is Senior Policy Analyst at the International Peace Institute. A version of this article was also published in the Indian Express. Hardeep Singh Puri is the Vice President of the International Peace Institute and the Secretary-General of the Independent Commission on Multilateralism. A longtime diplomat, he was previously India’s permanent representative to the UN in New York.